A signing ceremony was held at Dolphin Energy’s offices, attended by Dolphin Energy’s Chief Executive Officer, Mr Adel Ahmed Albuainain, and Captain Mohamed Juma Al Shamisi, CEO of Abu Dhabi Ports, as well as other senior management officials from both companies. The EPRS project allows Dolphin Energy to intervene at short notice and address any damage sustained to its subsea pipelines (the 48” export line and the twin 36” sea lines). The project incorporates the development of a pipeline repair capability that encompasses the organization, resources, documentation and processes that support intervention, recovery and repair in the shortest time possible. Strategically located at the Khalifa Industrial Zone Abu Dhabi (Kizad), the AED 55 Million-facility on 45,388 square metre-plot will accommodate all EPRS hardware which will be housed, maintained and kept in a state of readiness in the event it is required. “The Dolphin Gas Project meets 30% of the UAE’s energy requirements every single day so it is a significant strategic asset. The EPRS will allow us to address in the shortest time possible any damage sustained to our subsea pipelines and enhances our approach to risk management, quality and excellence. We are delighted to join forces with Abu Dhabi Ports in this way, whose support is critical in helping us maintain energy security for the country,” explained Mr Adel Ahmed Albuainain. 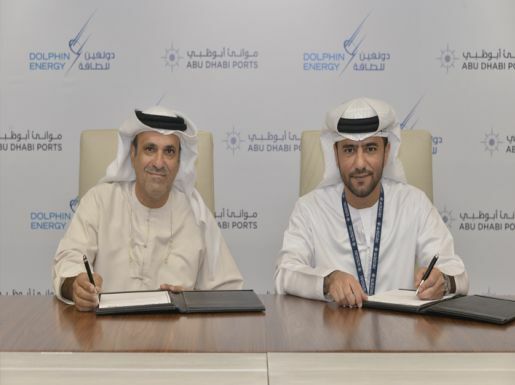 Captain Mohamed Juma Al Shamisi, CEO of Abu Dhabi Ports, commented: “We are proud to support Dolphin Energy’s project by providing ready-built infrastructure and the integrated services needed to ensure the uninterrupted availability of natural energy resources. The EPRS project demonstrates Kizad’s capability and facilities to host technologically advanced projects. This facility on Kizad’s Modular Path, which enables smooth movement of large plants and equipment to and from Khalifa Port to the customer’s site, will also draw attention to our combined efforts to enable economic developments while sustaining environmental needs. The first major equipment order for two subsea pipe handling frames is expected to be awarded by the middle of April 2016 for delivery in August 2017. The new emergency/marine base is scheduled for hand-over in September 2017 and completion of the EPRS project is expected by the beginning of 2018.